This highly detailed volume will be of particular interest to those with a knowledge of Physics and Mathematics alike. There is also much to interest the serious musician and those who are baffled in understanding keys or why a certain note in a harmonic triad sounds resolved and others unresolved. 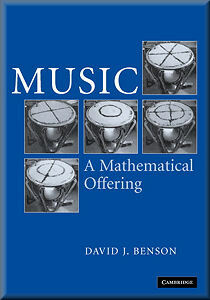 This book applies appropriate background theory and moulds it into a logical framework under the deft scholarship of mathematician, David Benson. There are sections that will possibly go over the heads of those lacking an understanding of calculus, yet will be very accessible to A-level mathematicians and physicists. One assumes that this book’s principal intention was as a textbook since each chapter ends with a few exercises to aid the tutor. For me it is a volume to dip into at random, to understand how MPEG/WAV/AIFF files are formulated or understand the logic of Scales and Temperaments. Material of particular interest to musicians is the music theory concerning keys, scales and frequency ratios. The subject of intervals has a full chapter to itself but tucked away among the Appendices. Since a foundational chapter is devoted to an explanation of the longitudinal propagation of Sound and the Human Ear I would have expected musical theory also to be provided as a foundational chapter rather than allocated an Appendix. An ‘Equal loudness’ set of curves was new to me and could fill a fundamental gap in knowledge. A nicely led introduction to sine waves soon runs with a jump into Fourier’s theory of harmonic analysis to explain harmonics on a string with their periodic functions and fourier coefficients. This nicely feeds into a section on standing waves and their application to the instruments of the orchestra (strings, pipes, plates, skins) in considerable detail. We also look at some of the lesser known and tribal instruments found around the world. There is a good chapter on Consonance and Dissonance that will also interest the musician. This is taken from an historic standpoint starting with the Greeks, then concerning Rameau and later Helmholtz. Benson draws on the work of Tenney and Plomp & Levelt. Bandwidth and complex tones are also examined as is Shepard’s fascinating musical paradox of a continually-rising scale. With no stone left unturned, there are lighter moments as well. A comment made by Gerard Hoffnung about a 13-tone scale is apt. Perhaps I expected to see some reference to the BBC’s Radiophonic workshop because although they used tape loops extensively (outside the scope of this book) they would have employed variations on the standard sine wave generator that one could be curious about. Readers with electronic learning will enjoy the section on Synthesizers, where the principle of positive feedback and envelope generators leads to the building of the first Hammond organ and Moog synthesizer - we all remember Moog’s Bach recordings of the 1960s. This then leads to the DX7 and an involved mathematical discussion of the algorithms that make the instrument’s sound possible. Benson is clearly knowledgeable on music and has amassed a considerable amount of material and presents it in a highly coherent way. He is keen to introduce comment on some of the composers who have made their mark by requesting bespoke sounds from the orchestra, such as Hindermith, Ravel, Scarlatti, Schubert, Stockhausen, Strauss, Stravinsky and Tavener.